The MBP Series C5 range of multi-head linear weighers is designed for sticky products and other goods that are difficult to handle. The mechanical and hardware development of the product has advanced hand in hand with the software: our weighers are controlled by software that is based entirely on Windows CE, it includes advanced mathematical functions, elimination of environmental disturbances and continual optimization of machine parameters. Our software has allowed us to push to the maximum in terms of weighing speed and accuracy. The industrial PC adopted is capable of processing an enormous quantity of data in just a few milliseconds; the weigher can be perfectly controlled remotely even with a mobile phone or tablet pc. 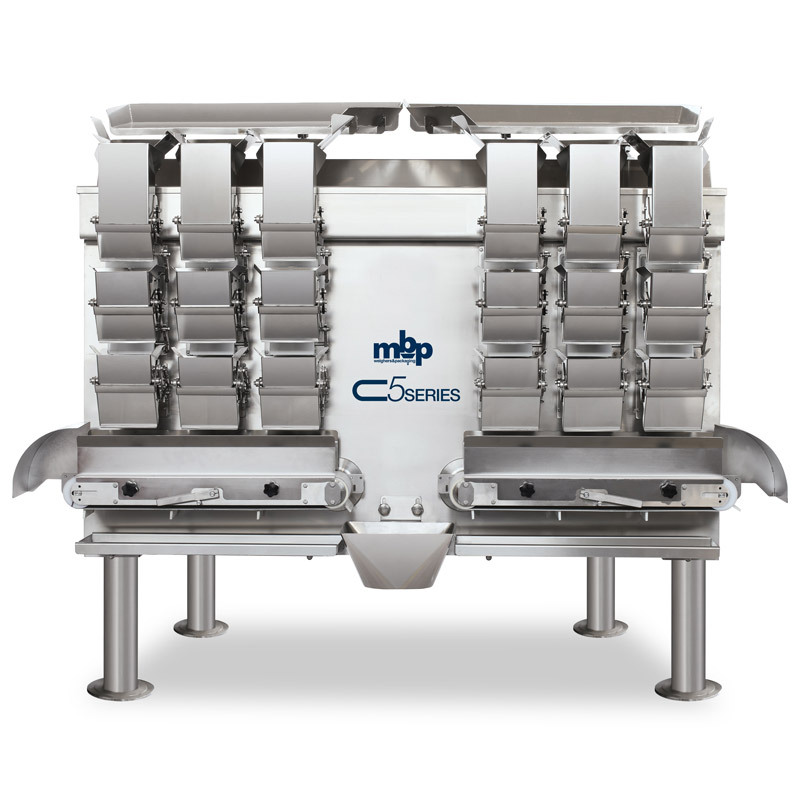 The MBP Series C5 range of multi-head linear weighers is designed for sticky productsand other goods that are difficult to handle. Unlike conventional multi-head weighers, the range features parallel weighing channels that are perfectly fed from two vibrating load plates. The exclusive DMA weighing system featuring in-line memory buckets guarantees maximum precision. The memory buckets work together with the weighing buckets to identify the best weight combination. Two extractable, completely sanitisable belts collect the product dropping from the weigh buckets and convey it to the centre of the weigher. Here it can be linked directly to a vertical packaging machine forming tube or multiple shuttle system feeding a thermo-forming or thermo-sealing machine. Sanitisation is one of the Series’ main selling points. The structure is constructed from AISI 304 stainless steel and the mechanical finish guarantees IP66 protection and can therefore be washed down using pressurised water jets. The frame has rounded corners so there are no parts that are hidden or difficult to reach, which prevents the formation of undesirable bacteria. The configuration of the buckets with the fronts facing the operator facilitate all cleaning and maintenance operations. For processing particularly sticky products, the Series C5 can be equipped with special SWING DOOR buckets complete with a double scraping device. This eliminates any product left behind thereby maintaining continuous weighing accuracy. The Series C5 is available in several versions while the number of buckets varies according to the speed/precision required. The 6-head version featuring memory cells produces up to 70 weighings a minute.